It is proposed that the widespread and pervasive distinctions between people (race, nation, family, profession, etc., etc.) which are now preventing mankind from working together for the common good, and indeed, even for survival, have one of the key factors of their origin in a kind of thought that treats things as inherently divided, disconnected, and "broken up" into yet smaller constituent parts. Each part is considered to be essentially independent and self-existent. The purpose of this website is to explain and solve previous philosophical problems that arose because of the wrong metaphysical foundations of our language (currently founded on four separate things - Matter as 'Particles' generating 'Forces / Fields' in 'Space' and 'Time'). Forces / Fields result from wave interactions of the Spherical In and Out Waves with other matter in the universe which change the location of the Wave-Center (and which we 'see' as a 'force accelerating a particle'). + = This rough diagram shows how the Spherical In and Out Waves form a Standing Wave around the Wave-Center 'particle'. I have added a few comments (GH) to the David Bohm article below, though I think the comments are pretty obvious once you understand the Wave Structure of Matter. David Bohm was a fine and interesting scientist philosopher, so I hope you enjoy reading the following article, Bohm quotations and biography. In autumn of 1992, one of the world's greatest contemporary physicists passed away. David Bohm, whose work inspired many people all over the world, died in London. David Bohm's contributions to science and philosophy are profound, and they have yet to be fully recognized and integrated on the grand scale. David Bohm was born on December 20, 1917, in Wilkes-Barre, Pennsylvania. Bohm was fascinated by the dazzling concepts of cosmic forces and vast expanses of space that lie beyond our understanding. Bohm began his theory with the troubling concern that the two pillars of modern physics, quantum mechanics and relativity theory, actually contradict each other. This contradiction is not just in minor details but is very fundamental, because quantum mechanics requires reality to be discontinuous, non-causal, and non-local, whereas relativity theory requires reality to be continuous, causal, and local. This discrepancy can be patched up in a few cases using mathematical re-normalization techniques, but this approach introduces an infinite number of arbitrary features into the theory that, Bohm points out, are reminiscent of the epicycles used to patch up the crumbling theory of Ptolmaic astronomy. Hence, contrary to widespread understanding even among scientists, the new physics is self-contradictory at its foundation and is far from being a finished new model of reality. Bohm was further troubled by the fact that many leading physicists did not pay sufficient attention to this discrepancy. Seeking a resolution of this dilemma, Bohm inquired into what the two contradictory theories of modern physics have in common. What he found was undivided wholeness. Bohm was therefore led to take wholeness very seriously, and, indeed, wholeness became the foundation of his major contributions to physics. According to quantum physics no matter how far apart two quanta's of light (photons) travel, when they are measured they will always be found to have identical angles of polarization. This suggests that somehow the two photons must be instantaneously communicating with each other so they know which angle of polarization to agree upon. Eventually, technology became available to actually perform the two particle experiment, but no one was able to produce conclusive results. Then in 1982 a remarkable event took place. At the University of Paris a research team led by physicist Alain Aspect performed what may turn out to be one of the most important experiments of the 20th century. There are some who believe his discovery may change the face of science. Aspect and his team discovered that under certain circumstances subatomic particles are able to instantaneously communicate with each other regardless of the distance separating them. It doesn't matter whether they are 10 feet or 10 billion miles apart. Somehow each particle always seems to know what the other is doing. GH - This is correct because matter is actually large, as a Spherical Standing Wave in Space (rather than a 'particle') thus is always continuously connected to all other matter in the Universe by its In and Out Waves. This meant that either Einstein's long-held theory that no communication can travel faster than the speed of light or the two particles are non-locally connected. Because most physicists are opposed to admitting faster-than-light processes into physics, this daunting prospect has caused some physicists to try to come up with elaborate ways to explain away Aspect's findings. But it has inspired others to offer even more radical explanations. David Bohm believes the reason subatomic particles are able to remain in contact with one another regardless of the distance separating them is not because they are sending some sort of mysterious signal back and forth, but because their separateness is an illusion. Bohm postulates that the ultimate nature of physical reality is not a collection of separate objects (as it appears to us), but rather it is an undivided whole that is in perpetual dynamic flux. For Bohm, the insights of quantum mechanics and relativity theory point to a universe that is undivided and in which all parts merge and unite in one totality. This undivided whole is not static but rather in a constant state of flow and change, a kind of invisible ether from which all things arise and into which all things eventually dissolve. Indeed, even mind and matter are united. Bohm refers to his theory as the holomovement. The terms holo and movement refer to two fundamental features of reality. The movement portion refers to the fact that reality is in a constant state of change and flux as mentioned above. The holo portion signifies that reality is structured in a manner that is very similar to holography. Bohm says that the universe is like a hologram. GH - This is correct, this dynamic flux is caused by the Wave Structure of Matter in Space (One Continuously Connected Wave Medium). So, in order to understand what that means, we need to have some idea of the components and structure of a hologram. There are several explanations, but here is something of the idea. To construct a hologram you need two beams of light (lasers). One beam will bounce off the object that you want as a hologram, and the other beam will shine directly onto the special photographic plate or film. The interference patterns of those two light sources will interact on the plate. They swirl around and do not look like anything in particular if you are looking at the plate. If, however, you shine a laser beam through the plate of film, the object will be reproduced in the 3-dimensional form of a hologram. And further more, if you tear the plate apart and shine the beam of light through any of the pieces, the whole object can be reproduced. So, in essence, each part contains the patterns for the whole picture. One of Bohm's most startling assertions is that the tangible reality of our everyday lives is really a kind of illusion, like a holographic image. Underlying it is a deeper order of existence, a vast and more primary level of reality that gives birth to all the objects and appearances of our physical world in much the same way that a piece of holographic film gives birth to a hologram. Bohm calls this deeper level of reality the implicate (which means enfolded or hidden) order, and he refers to our own level or existence as the explicate, or unfolded order. Put another way, electrons and all other particles are no more substantive or permanent then the form a geyser of water takes as it gushes out of a fountain. They are sustained by a constant influx from the implicate order, and when a particle appears to be destroyed, it is not lost. It has merely enfolded back into the deeper order from which it sprang. GH - The central point here is that our mind represents our senses (due to our evolution based on survival) rather than providing a true picture of reality. However, reason tells us that matter is clearly interconnected (e.g. the earth orbits the sun) and that there must be knowledge flowing into matter to explain how we can see things around us. This is correct, and explained by the Spherical In-Waves which form the 'particle' effect of matter at their Wave-Center. A piece of holographic film and the image it generates are also an example of an implicate and explicate order. The film is an implicate order because the image encoded it its interference patterns is a hidden totality enfolded throughout the whole. The hologram projected from the film is an explicate order because it represents the unfolded and perceptible version of the image. Bohm is not the only researcher who has found evidence that the universe is a hologram. Working independently in the field of brain research, Stanford neurophysiologist Karl Pribram has also become persuaded by the holographic nature of reality. He says that the human brain can be modeled as a hologram. Pribram was drawn to the holographic model by the puzzle of how and where memories are stored in the brain. For decades numerous studies have shown that rather than being confined to a specific location, memories are dispersed throughout the brain. In a series of landmark experiments in the 1920's, brain scientist Karl Lashley found that no matter what portion of a rat's brain he removed he was unable to eradicate its memory of how to perform complex tasks it had learned prior to surgery. The only problem was that no one was able to come up with a mechanism that might explain this curious whole in every part nature of memory storage. Then in the 1960's Pribram encountered the concept of holography and realized he had found the explanation brain scientists had been looking for. Pribram believes memories are encoded not in neurons, or small groupings of neurons, but in patterns of nerve impulses that crisscross the entire brain in the same way that patterns of laser light interference crisscross the entire area of a piece of film containing a holographic image. GH - This is important, as again it is founded on the principle that matter is large and subtly interconnected to other matter in the space around us, as the Wave Structure of Matter explains / confirms. Capitalizing on Pribram's findings, Bohm states that our brains are smaller pieces of the larger hologram. That our brains contain the whole knowledge of the universe. So, you can see how each mind has a limited perspective of the universal hologram. Our brains are our windows of perception. Each mind always contains the whole picture, but with a limited and unclear perspective. We each have different experience in our lives, but each perspective is valid. Our brains mathematically construct objective reality by interpreting frequencies that are ultimately projections form another dimension, a deeper order of existence that is beyond both space and time. GH - Time, along with particles, is a human representation, both being caused by the wave Motion of Space (thus the name of this website SpaceandMotion). So the Wave Structure of Matter is founded on the Metaphysics of Space and (wave) Motion rather than Space and Time. But Space itself does physically exist (as a Wave-Medium). The brain is a hologram enfolded in a holographic universe. We can view ourselves as physical bodies moving through space. Or we can view ourselves as a blur of interference patterns enfolded throughout the cosmic hologram. This could be also expressed with the analogy that the brain is like the laser beam that shines through the holographic film to interpret the patterns. As it turns out, you can preserve the interference patterns of more than one hologram on the same film by using various different angles of projection of the laser beams. Therefore, depending on the direction and frequency of the beam that you send through the film, a different hologram will appear. So, if applied to the brain, consciousness literally becomes the co-creator of the reality portrayed depending upon its angle of perception. This does not mean that if I am looking at a tree, it is not really there. The tree is there on multidimensional levels, which means that I am seeing a cross-section of the tree depending on the level of consciousness that I am tuned into. If the brain is a decoder of sorts, then it can be tuned to different states or frequencies of consciousness, and I will see different levels of tree reality depending upon which one I'm on. Therefore, mind contributes to the phenomenon of reality itself, not just to the knowledge of it. In a brain that operates holographically, the remembered image of a thing can have as much impact on the senses as the thing itself. Bohm uses his idea of the implicate order, the deeper and non-local level of existence from which our entire universe springs, to echo this sentiment: Every action starts from an intention in the implicate order. The imagination is already the creation of the form; it already has the intention and the germs of all the movements needed to carry it out. And it affects the body and so on, so that as creation takes place in that way, from the subtler levels of the implicate order, it goes through them until it manifests in the explicate. In other words, in the implicate order, as in the brain itself, imagination and reality are ultimately indistinguishable, and it should therefore come as no surprise to us that images in the mind can ultimately manifest as realities in the physical body. So it appears that through the use of images, the brain can tell the body what to do, including telling to make more images. Such is the nature of the mind/body relationship in a holographic universe. According to the holographic model, the mind/body ultimately cannot distinguish the difference between the neural holograms the brain uses to experience reality and the ones it conjures up while imagining reality. This effect is so powerful that each of us possesses the ability, at least at some level, to influence our health and control our physical form. Contemporary scientists may ignore Bohm's work (as many have done), but they cannot escape its implications. His hypothesis is rigorously grounded in the experimental evidence of physics, and such it is not just a new way of thinking about physics, it is a new physics, that is, it is a entirely new way of understanding the fundamental nature of the physical universe, as glimpsed through the data and laws of physics. It isn't that the world of appearances is wrong; it isn't there aren't objects out there, at one level of reality. It's that if you penetrate through and look at the universe with a holographic system, you arrive at a different reality. And that other reality can explain things that have hitherto remained inexplicable scientifically: paranormal phenomena, and synchronicities, the apparently meaningful coincidence of events. (Karl Pribram) Bohm's holographic theory has found fruitful application in brain physiology and human consciousness. This theory opens new lines of research, it predicts hitherto unknown phenomena, and makes some novel predictions. Bohm points out that there is no scientific evidence that argues for the dominant fragmented scientific world view over Bohm's hypothesis of undivided wholeness. However, while scientific evidence offers no help in this regard, other forms of evidence may, indeed, shed some light on the matter. For example, mystical and spiritual teachings down through the ages have also spoken about the fundamental interconnectedness of all things. If Bohm's physics, or one similar to it, Gary Zukav writes in his popular New Age book The Dancing Wu Li Masters (1979), should become the main thrust of physics in the future, the dances of East and West could blend in exquisite harmony. Do not be surprised if physics curricula of the twenty-first century include classes in meditation. With the model of the holographic brain, the holographic universe, and Quantum Physics, we could speculate that all that we hold as real is nothing more than the playful dance of light, light that has no dimension and limitless dimension. The radical implications of Bohm's implicate order take some time to fully grasp, especially for Western minds, but whether Bohm's holographic paradigm becomes accepted in science or not remains to be seen. GH - It is useful to read the Wave Structure of Matter articles on Metaphysics, Quantum Theory, Albert Einstein's Theory of Relativity and Cosmology, which provide sensible explanations of these famous theories. Bohmian mechanics, which is also called the de Broglie-Bohm theory, the pilot-wave model, and the causal interpretation of quantum mechanics, is a version of quantum theory discovered by Louis de Broglie in 1927 and rediscovered by David Bohm in 1952. It is the simplest example of what is often called a hidden variables interpretation of quantum mechanics. In Bohmian mechanics a system of particles is described in part by its wave function, evolving, as usual, according to Schrödinger's equation. However, the wave function provides only a partial description of the system. This description is completed by the specification of the actual positions of the particles. The latter evolve according to the "guiding equation," which expresses the velocities of the particles in terms of the wave function. Thus, in Bohmian mechanics the configuration of a system of particles evolves via a deterministic motion choreographed by the wave function. In particular, when a particle is sent into a two-slit apparatus, the slit through which it passes and where it arrives on the photographic plate are completely determined by its initial position and wave function. Bohmian mechanics inherits and makes explicit the nonlocality implicit in the notion, common to just about all formulations and interpretations of quantum theory, of a wave function on the configuration space of a many-particle system. It accounts for all of the phenomena governed by nonrelativistic quantum mechanics, from spectral lines and scattering theory to superconductivity, the quantum Hall effect and quantum computing. In particular, the usual measurement postulates of quantum theory, including collapse of the wave function and probabilities given by the absolute square of probability amplitudes, emerge from an analysis of the two equations of motion - Schrödinger's equation and the guiding equation - without the traditional invocation of a special, and somewhat obscure, status for observation. I would say that my scientific and philosophical work, my main concern has been with understanding the nature of reality in general and consciousness in particular as a coherent whole, which is never static or complete, but which is in an unending process of movement and unfoldment. Thus, when I look back, I see that even as a child I was fascinated by the puzzle, indeed the mystery, of what is the nature of movement. Whenever one thinks of anything, it seems to be apprehended either as static or as a series of static images. Yet, in the actual experience of movement, one senses an unbroken, undivided process of flow, to which the series of static images in thought is related as a series of 'still' photographs might be related to the actuality of a speeding car. If we supposed that theories gave true knowledge, corresponding to 'reality as it is', then we would have to conclude that Newtonian Mechanics was true until around 1900, after which it suddenly became false, while relativity and quantum theory suddenly became the truth. Such an absurd conclusion does not arise, however, if we say that all theories are insights, which are neither true nor false. The main problem with modern physics is that quantum mechanics gives only the probability of an experimental result. Neither the decay of an atomic nucleus nor the fact that it decays at one moment and not another can be properly pictured within the theory. It can only enable you to predict statistically the results of various experiments. In the Fifties, I sent my book (Quantum Theory) around to various quantum physicists - including Niels Bohr, Albert Einstein, and Wolfgang Pauli. Bohr didn't answer, but Pauli liked it. Albert Einstein sent me a message that he'd like to talk with me. When we met he said the book had done about as well as you could do with quantum mechanics. But he was still not convinced it was a satisfactory theory. Einstein's objection was not merely that it was statistical. He felt it was a kind of abstraction; quantum mechanics got correct results but left out much that would have made it intelligible. I came up with the causal interpretation (that the electron is a particle, but it also has a field around it. The particle is never separated from that field, and the field affects the movement of the particle in certain ways). Einstein didn't like it, though, because the interpretation had this notion of action at a distance: Things that are far away from each other profoundly affect each other. He believed only in local action. It seems that people are ready to wait twenty years for results if you've got formulas. If there are no formulas, they don't want to consider it. Formulas are means of talking utter nonsense until you understand what they mean. Every page of formulas usually contains six or seven arbitrary assumptions that take weeks of hard study to penetrate. When I was a boy a certain prayer we said every day in Hebrew contained the words to love God with all your heart all your soul, and all your mind. My understanding of these words, that is, this notion of wholeness - not necessarily directed toward God but as a way of living - had a tremendous impact on me. I also felt a sense of nature being whole very early. I felt internally related to trees, mountains, and stars in a way I wasn't to all the chaos of the cities. David Joseph Bohm (December 20, 1917 - October 27, 1992) was an American quantum physicist / philosopher of science. Born at Wilkes-Barre, Pennsylvania, Bohm attended Pennsylvania State College, graduating in 1939 and then heading west to work with theoretical physicist Robert Oppenheimer, first at the California Institute of Technology for a year, and then at the University of California, Berkeley. Along with a few of Oppenheimer's other graduate students (Giovanni Rossi Lomanitz, Joseph Weinberg, and Max Friedman, all of whom lived in the same neighborhood), Bohm became increasingly involved not only with physics, but with radical politics. 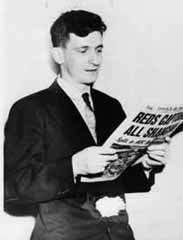 Like many young idealists in the late 1930s (including Oppenheimer himself), Bohm and his colleagues gravitated to alternative models of society, and became active in organizations like the Young Communist League, the Campus Committee to Fight Conscription, and the Committee for Peace Mobilization (all of which the FBI under J. Edgar Hoover would brand as Communist fronts). During World War II, the Manhattan Project mobilized much of Berkeley's physics research in the effort to produce the first atomic bomb. Though Oppenheimer had asked Bohm to work with him at Los Alamos, the top-secret laboratory established in 1942 to design the weapon, the head of the Manhattan Project, General Leslie Groves, would not approve his security clearance, after tip-offs about Bohm's politics (Bohm's friend, Joseph Weinberg, had also come under suspicion for espionage). Bohm remained in Berkeley, teaching physics, before completing his Ph.D. in 1943, under an unusually ironic circumstance. According to Peat (see reference below, p.64), "the scattering calculations [of collisions of protons and deuterons] that he had completed proved useful to the Manhattan Project and were immediately classified. Without security clearance, Bohm was denied access to his own work; not only would he be barred from defending his thesis, he was not even allowed to write his own thesis in the first place! To satisfy the university, Oppenheimer certified that Bohm had successfully completed the research." He would later, however, work on the theoretical calculations for the Calutrons at the Y-12 facility in Oak Ridge, used to electromagnetically enrich uranium for use in the bomb dropped on Hiroshima in 1945. 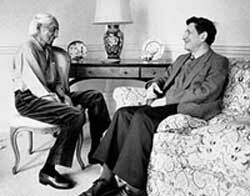 After the war David Bohm became an assistant professor at Princeton University, where he worked closely with Albert Einstein. In May 1949, at the beginning of the McCarthyism hysteria period, the House Un-American Activities Committee called upon Bohm to testify before it - because of his previous ties to suspected Communists. But Bohm pleaded the Fifth amendment right to decline to testify, and refused to give evidence against his colleagues. In 1950 Bohm was charged for refusing to answer questions before the Committee and arrested. He was acquitted in May 1951 but Princeton had already suspended him, and after his acquittal refused to renew his contract. Bohm's colleagues sought to have his position at Princeton re-instated, and Einstein reportedly wanted Bohm to serve as his assistant, but the university did not renew the contract. Bohm then left for Brazil to take up a Chair in Physics at the University of São Paulo. In 1955, he moved to Israel where he spent two years at the Technion at Haifa. Here he met his wife Saral, who became an important figure in the development of his ideas. In 1957 Bohm moved to the UK. He held a research fellowship at University of Bristol until 1961, when he became Professor of Theoretical Physics at Birkbeck College of the University of London, post he held until his retirement in 1987. David Bohm made a number of significant contributions to physics, particularly in the area of quantum mechanics and relativity theory. While still a post-graduate at Berkeley he discovered the electron phenomenon now known as Bohm-diffusion. His first book, Quantum Theory published in 1951, was well-received by Einstein among others. However, Bohm became unsatisfied with the orthodox approach to quantum theory which he had written about in that book and began to develop his own approach (Bohm interpretation), a non-local hidden variable deterministic theory whose predictions agree perfectly with the quantum, indeterministic, ones. His work and the EPR argument became the major factor motivating John Bell's inequality, whose consequences are still being investigated. In 1959, with his student Yakir Aharonov, he discovered the Aharonov-Bohm effect, showing how a electro-magnetic field could affect a region of space in which the field had been shielded, although its vector potential did exist there. This showed for the first time that the vector potential, hitherto a mathematical convenience, could have real physical (quantum) effects. Bohm's scientific and philosophical views were inseparable. In 1959 he came across a book by the Indian philosopher J. Krishnamurti. It struck him how his own ideas on quantum mechanics meshed with the philosophical ideas of Krishnamurti. Bohm's approach to philosophy and physics receive expression in his 1980 book Wholeness and the Implicate Order, and in the book Science, Order and Creativity. In his later years, he developed the technique that has become known as "Bohm Dialogue", in which equal status and "free space" form the most important prerequisites. He believed that if carried out on a sufficiently wide scale, such Dialogues could help overcome fragmentation in society. David Bohm died of a heart attack in London on October 27, 1992.